Plane Talk: Got a question? Ask the Captain! 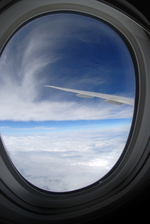 Do you have a question about airline safety, flight etiquette, jet lag, or air travel in general? Submit your question and look for answers in a future column. I certainly understand your anxiety and you are definitely not the "Lone Ranger" out there. A medical doctor, I am not. Nor am I a doctor of any sorts, I am a pilot. What I share with you is knowledge from this perspective. I hope what I say is of some help. I can explain to you the "why" and "how" an aircraft flies, but here, I will briefly go over some flight conditions.......just for you. Hummmmmm ................turbulence, the "rock and roll" of flying. Aircraft are actually "airships" riding on and in rivers of air instead of water. They ( the airships...a.k.a. airplanes ) are designed and manufactured to a much higher standard than almost any other type of construction. This is so airplanes can bend by design and yet, stay strong. These are both good things.